FLASH: At the earliest date ever, the Nenana Ice Classic ended on April 14 at 12:21 a.m. Winners are still being determined. NENANA, ALASKA — In the middle of the frozen river that skirts this frozen town, a striped tripod stands stuck in the ice. A cable stretching from shore-to-shore is rigged to the tripod and tied to a clock. Sometime this spring, when the river thaws, the tripod will break loose and float downstream. The clock will record the time. And someone — or perhaps dozens of someones — will get rich. “There are strange things done in the midnight sun,” poet Robert W. Service wrote. But almost as strange as “The Cremation of Sam McGee” is the story of how bets taken in a roadhouse in 1917 have grown into a multimillion-dollar charity event. The Nenana Ice Classic is more than a lottery. 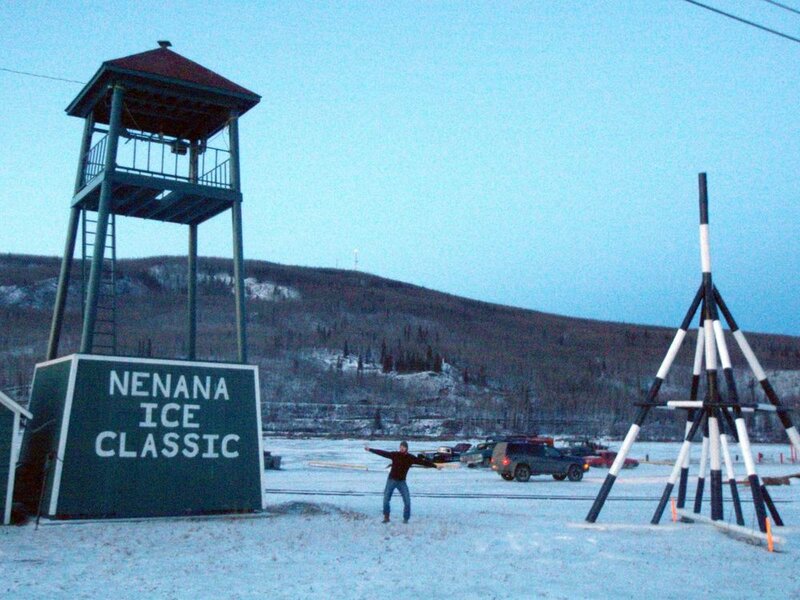 With a more than a quarter million in prize money and a quarter million bets placed from around the world, the Ice Classic is Nenana’s moment in the sun. And in a town of 376 people, where winter temps dip to 40 below, a moment in the sun is worth more than a $2.50 ticket. It all started in Jimmy Duke’s Roadhouse. A bunch of the boys — railroad workers — were whooping it up one night when they decided to bet on spring. Eight hundred dollars landed in the pot. Rules determined how to time the thaw, and the bet was on. Though limited to Alaskans, the prize swelled to $14,000 in 1925, the year Nenana was the starting point for the fabled dog sled trek taking medicine to Nome. Betting rose through Depression and war, reaching a jackpot of $100,000 in 1945, then leveling off. Once the Internet opened betting worldwide, the classic made national media and numbers skyrocketed. These days, it all starts in early March — Tripod Weekend. That’s when locals trudge onto the Tanana River to plant the tripod, which curiously has four legs. (Don’t ask.) Anchoring four legs in three feet of ice takes time and power tools, but once planted, the cable is strung, the clock is mounted and the betting — which begins February 1 — heats up. By state law, bets must be placed in Alaska, but you can enter online and some nice Nenanan will fill out your ticket(s). 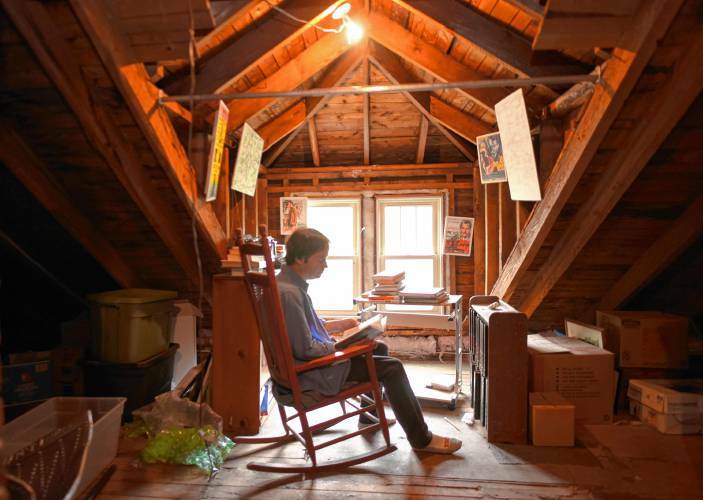 With a month-long window determining the payoff, the odds beat any state lottery. But bettors are advised do the math, using the classic’s meticulous records. The Book of Guesses, listing each bet and time, runs to 1,200 pages. Though it makes dull bedtime reading, the book shows that hope springs eternal, even where spring comes late. The earliest breakup of ice was April 20, and global warming has moved the average date up about five days. Still, guesses are all over the calendar. Many want to be the lone winner, claiming the full jackpot. So guesses start in January. Hey, you never know! These Hail Mary bets continue through February and March. As likelier dates approach, bets start to cluster. By mid-April, every last minute is claimed by a dozen or more. Numerology kicks in on April 20 at 4:20 p.m. (4:20 on 4/20) chosen by 400 guessers. On the guesses go, page after page. Some bet minute-by-minute for days on end, racking up thousands in ticket costs. Others form betting pools with nicknames. Dog Patch Pool. Mug Shot Hooligans. Cheezy Five. 50 Old Farts. Wild guesses resume after May 20, the latest breakup ever. Wild guessers pin their hopes on some nightmarish summer when the ice might hold on to July, August, or all the way through to December. Some hope. Last year, and the year before, the ice broke on May 1. More than 18,000 bets were placed for the day before, and dozens missed by a single minute. But 35 people, all from Alaska, chose the exact time — 1:18 p.m. Each won $6,428.57. That’s a far cry from the $318,500 claimed by a rare single winner in 2013, farther still from the top lone winnings in 1941. That $98K jackpot equaled $1.7 million in today’s dollars. Not a bad way to end the Depression. If you’re betting this year, bet early. Volunteers measure the ice twice a day. The thickness usually peaks in late March at about 40 inches, but last week it was just 23 inches, thinner than ever this late in the game. “It very possibly could be a record year," Ice Classic manager Cherrie Forness told the Fairbanks Ice Miner. Regardless of when Nature pays off, the bulk of proceeds go to charity. These include the American Cancer Society, the Fairbanks Food Bank, local public schools and senior centers, and other causes. Since 1917, the classic has given more than $10 million to charity. So step online and place your bet (through April 5). Daytime temps in Nenana this week will be in the 30s. The ice is thinning. The clock is set. Your fortune awaits. Or at least hope, as eternal as spring.